We love the high quality of Bezel & Bytes' genuine leather Apple Watch bands with added bling. 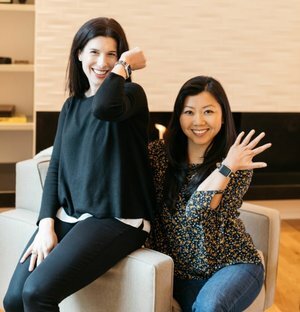 Wearable tech just got way more fashionable with Bezels & Bytes — a San Francisco-based company dedicated to empowering women who love technology with new and fashionable ways to wear it. Bezels & Bytes was founded in 2016 by Melissa Koerner and Sarah Shapiro, two retail veterans from Gap and Bloomingdales. 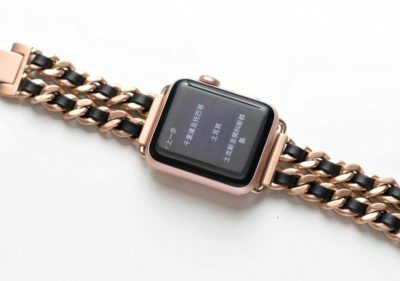 Bezel’s & Bytes transforms Apple Watch into jewelry with its decidedly-female collection of stainless steel-accented bands. The company designs high-quality, well-made leather Apple Watch bands accented with shiny, stainless-steel zippers, and studs, and chains … oh my. Three years later, the company is booming and adding new designs to its ever-expanding collection of bands — upping the style quotient for Apple Watch one band at a time. We love the high quality of Bezel & Bytes’ genuine leather Apple Watch bands with added bling. All hardware is stainless steel and nickel-free. 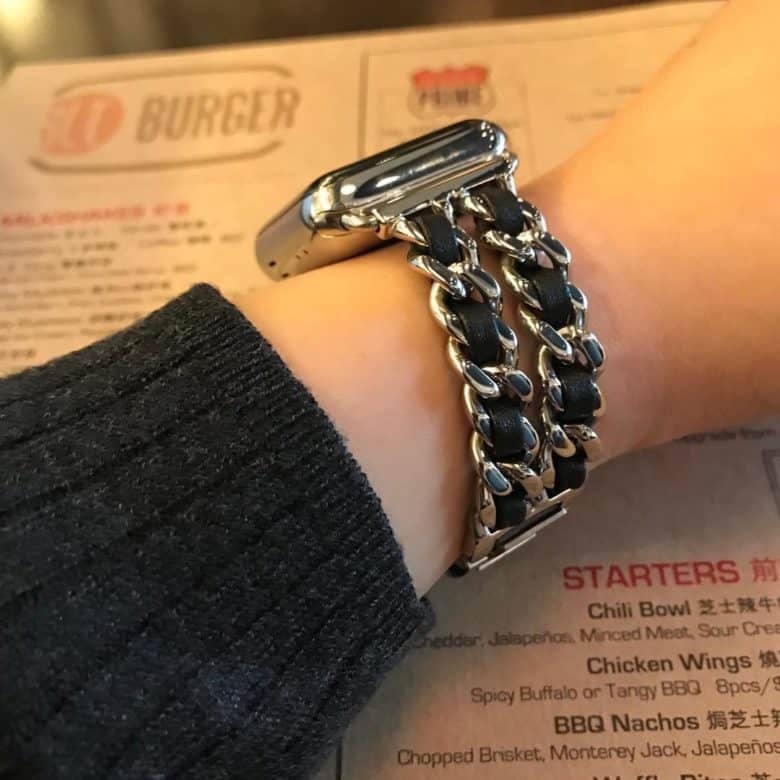 High-quality genuine leather twists its way through a shiny, stainless steel chain in the Chainlink and Leather Apple Watch Band by Bezels & Bytes. This stunning band will certainly embellish any look. Add a bangle or two for added polish. This beautiful piece of jewelry includes extra links that are simple to remove to fit any wrist size 5.2” or greater. Extremely comfortable and nickel-free stainless steel for people like myself with metal allergies. 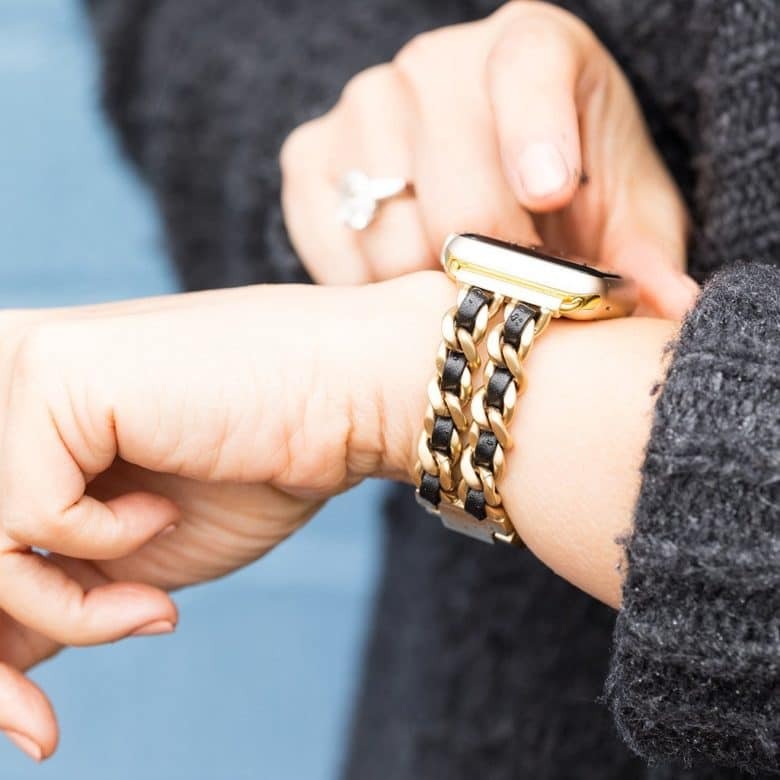 Choose from black leather with silver, rose gold or gold chainlink to best accent your Apple Watch. The Studded Leather Band in Gold. 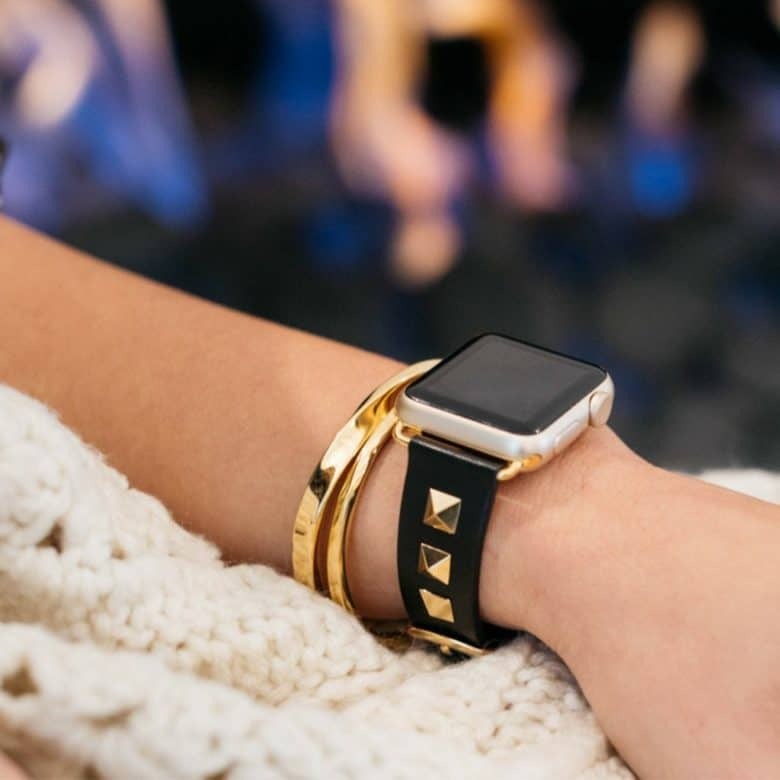 For a little punk and polish, check out the Studded Leather Apple Watch Band. Fine leather is punctuated with eye-catching stainless steel studs in gold, silver or rose gold. Very high-quality construction and a perfect fit. 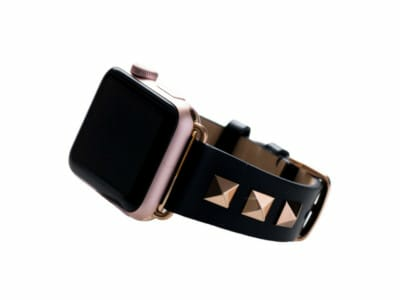 The Studded Leather Band in Black and Rose Gold is new to the Bezels & Bytes lineup. Both studs and buckles are nickel-free for those with sensitive skin. This studded band comes in regular and extended wrist sizes, fitting 5.5″-6.5″ and 6.5″-7.5″ sized wrists, respectively. Couple these bands with a few coordinating bracelets to bump your style up a few notches. Choose black, white or blush studded leather. Made of genuine leather, this shimmery strap is fun and luxurious. Brand-new to Bezels & Bytes gorgeous collection of Apple Watch bands is the Glitter Leather band. 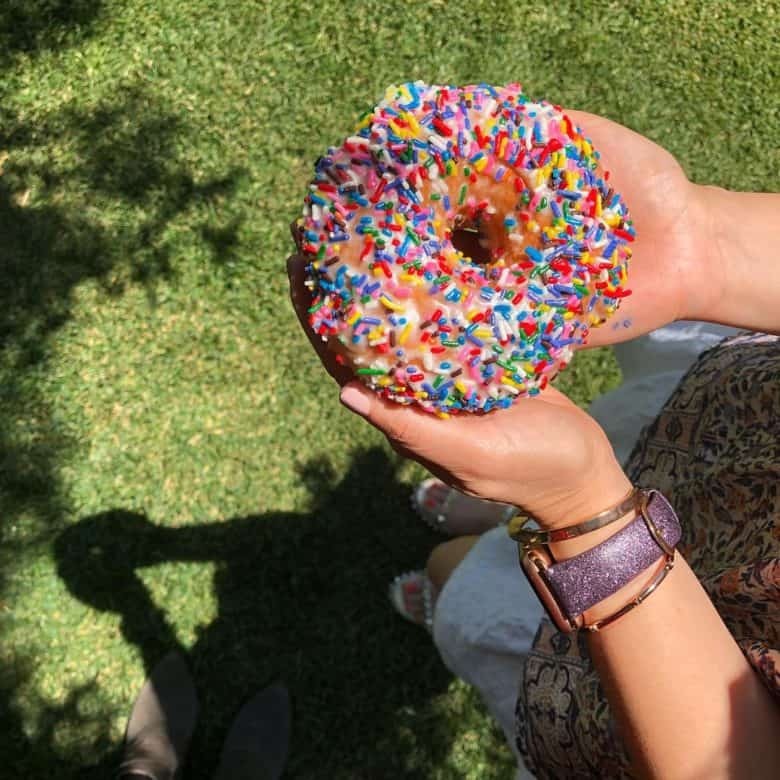 Add extra sparkle to your day with this band made of high-quality genuine leather dotted with glitter. This shimmery strap is perfect for everyday luxury and style. The Zipper-Edged Apple Watch band comes in black or brown leather. A smooth, stainless-steel zipper edges a black or brown, genuine leather band. Super comfortable wrist feel with an edgy slant. The brown leather band fits regular wrist sizes 5.5″-6.5″, while the black band comes in both regular and extended (6.5″-7.5″). 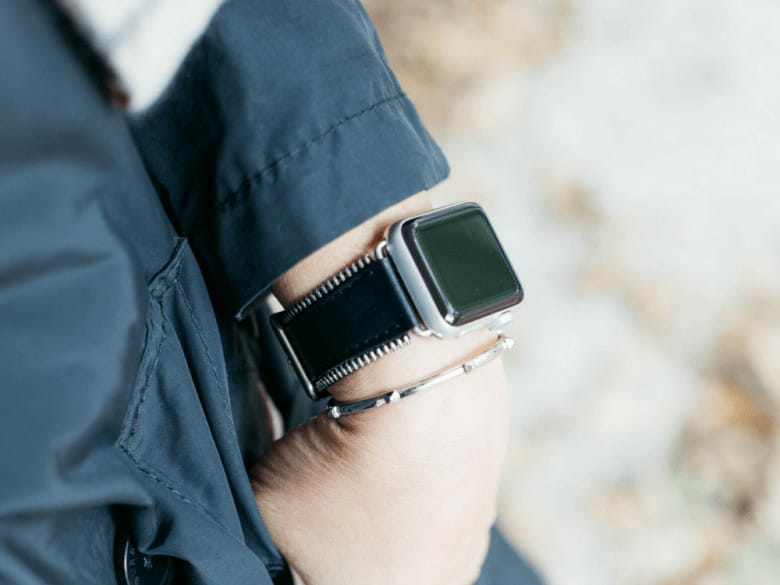 All of Bezel’s & Bytes Apple Watch bands include matching adapters and stainless-steel buckles for easy adjustment. Bands are available in 38 mm and 42 mm Apple Watch sizes. All of Bezels & Bytes bands come in an adorable glittery-gold zippered pouch — perfect for gifting! Bezels & Bytes provided Cult of Mac with review units for this article. See Cult of Mac’s reviews policy; and check out more stuff we recommend in our Best List reviews.